There is much to be said about the effectiveness of face-to-face communication, even when the faces are being seen through electronic wizardry. That is especially true in conversations involving money and financial transactions, where meaning cannot be confused and seeing somebody speaking helps two parties see matters eye-to-eye. But that does not mean it is going to be a regular communication device for advisors and investors; not yet, anyway. Spectrem’s study in the use of social media and mobile technology is forward-looking, and the question of video usage for communication is well-covered. But it does not show complete support of the technology among investors. The question is: Are you willing to have a meeting with an investor via video-chat? Like other forms of electronic communication, video-chatting does require compliance with federal guidelines and regulations. It is possible your video-chat conversation will need to be recorded. But the opportunity to video-chat might be a positive spin for investors who really, really like to have face-to-face meetings. A discussion about using that technology at the beginning of a relationship, or when a client has an issue that requires multiple meetings, could streamline the process of solving the problem and moving on. If an advisor is a veteran video-chat user, with experience from in-house meetings or long-distance relationships, that advisor can promote the idea of video-chatting with investors who might not have yet considered using that technology in their investment process. How much interest is there in video-chatting with advisors? According to the Spectrem study, there is great interest among younger investors, and as wealth increases among investors, so does interest in video-chatting. Asked to rate their interest on a 0-to-100 scale, Ultra High Net Worth investors with a net worth between $5 million and $25 million rated their interest at 22.75, which is a very low average. But Millennials and Gen X investors, the relatively young group that continues to grow in investment potential, rated it at 41.04, much nearer a mid-point of interest. Interestingly, both numbers were well below the rating given one year ago. Reticence for video-chatting may be related to vanity; if the face is close to the computer camera, the look can be revealing. But the desire to speak and understand each other clearly should supersede any concerns about visible blemishes, and certainly, an advisor can create a setting for the camera when conducting video-chat meetings that can present the best possible look. Video-chatting is going to become more popular, especially when people fully realize the limitations of texting and email. 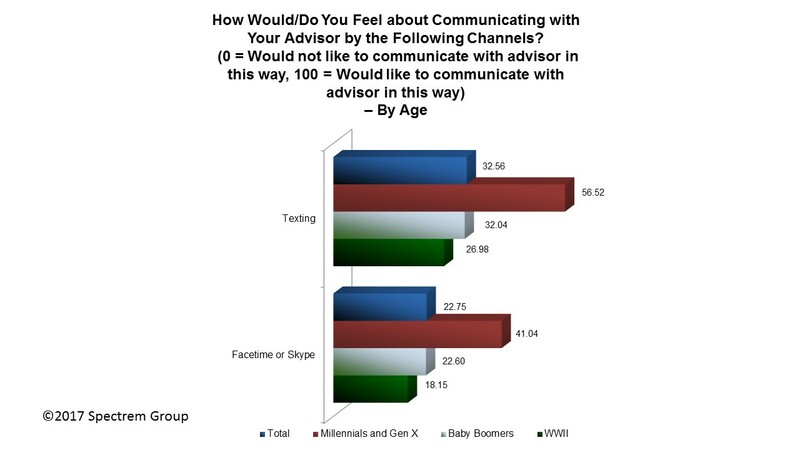 Advisors need to determine which investors are willing to have substantive conversations on FaceTime or Skype or other video services. They will make the process faster and probably help develop a closer relationship with the investor. Meetings conducted via video-chat have limitations, especially when it comes to paperwork. But assuming any printed information can be emailed (again with a thought to compliance guidelines), such limitations are only a slight inconvenience, and a technologically advanced investor might not see those limitations as problematic at all. There are few limitations on video-chatting. Investors can do it from their desktop, laptop, tablet or smartphone. Advisors with strong people skills should encourage investors to consider video-chatting as a way to conduct business conversations in order to get the best possible connection between intent and performance.